An fMRI study shows different dogs have different preferences for food and social interaction. A recent fMRI study investigates individual differences in dogs’ preferences for food and social interaction with their owner. The results have been widely – and erroneously – reported as showing that dogs prefer praise to food. In fact, the results paint a far more interesting picture of how brain activity predicts canine choice. I think most people feel subjectively that their dog loves them. The idea they might not is perplexing. But scientists have this wonderful habit of testing ideas, and a paper by Peter Cook (Emory University) et al investigates dogs’ preferences for food and for social interaction with their owner. What if dogs love both? The team of neuroscientists at Gregory Berns’ lab took 15 dogs who are trained to go in the fMRI machine. They designed an experiment to look at activation of the dogs’ brains in response to food, praise from their owner, and a control condition of nothing happening. They found individual differences in the responses. Since the dog has to keep absolutely still in the scanner, the way the scientists did the experiment was to pair a different item with each of the three consequences. Each item was presented to the dog on a stick for 10 seconds. Following this presentation, the relevant event happened. If it was the toy car, the dog’s handler stepped into view and praised the dog (“Yay! Good boy!”). If it was the toy horse, a piece of hot dog was given to the dog to eat. The hot dog was presented on a stick so that no human came into view. Finally, if the item was the hair brush, there was a short pause in which nothing happened. This was the control condition. The dogs had two training sessions, during which each item and its paired consequence happened forty times in total. This was to ensure they knew the items predicted the different consequences. They had a quick reminder of them before each of two experiments. In the first experiment, dogs kept still in the scanner while presented with the item-consequence pairs in a random order. The sessions took place over 2 – 4 days until each dog had seen each item and its paired consequence 32 times. A dog called Kady is presented with a stimulus in the fMRI scanner. (Creative Commons licence). The results look at activation of a part of the brain called the ventral caudate, which is connected to positive associations. In previous work, Berns and colleagues have shown this part of the brain is activated when the dog smells a familiar person and when a dog anticipates receiving a food reward. The main aim of this study was to find out if different dogs have different preferences, i.e. do some have greater caudate activation to owner/praise than to food, and vice versa. At a general level, there was no significant difference in caudate activation between food and praise. I mention this because many reports have erroneously said these findings show dogs prefer praise to food; not so (just imagine if they did; dogs might all die of starvation). However, caudate activation occurred in response to both food and praise, suggesting the dogs found both rewarding. 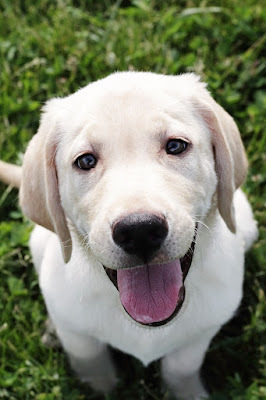 At an individual level, there were differences between dogs: 9 of the dogs had roughly equal positive responses to food and praise, but 4 preferred praise and 2 preferred food. 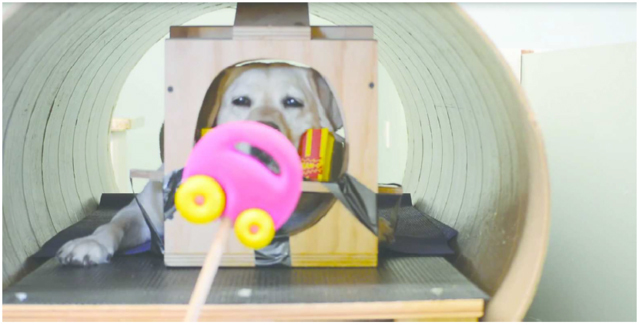 In a second experiment with 13 of the dogs, the researchers tested what happened when praise was sometimes withheld despite the car being shown to the dog. A quarter of the times when the car was shown, praise did not occur, causing a violation of the dog’s expectations. Only data from 12 of the dogs could be used here, as one dog moved too much in the scanner. The results from the first experiment predicted the results in this experiment. In other words, the dogs for whom there was greater caudate activation in the praise condition in experiment 1 showed a bigger difference in caudate activation between the trials when they got praise and the trials when praise was withheld. This confirms they did like praise. In a final experiment, the scientists wanted to know if the activation they saw in the caudate would predict the dogs’ responses when they gave them a choice between food and the owner. This study took place in the room where dogs were previously trained to go in the scanner. When dogs went into the room, they had a choice in a maze. They could run down one side of a barrier to find food, or down the other side where their owner was waiting with their back to them. In this experiment, the owner was allowed to pet and praise the dog. In the food option, the dish contained 1 – 3 small pieces of Pupperoni dog treats and the dogs were allowed to eat what they found. All 15 dogs took part in this experiment. First of all they had four trials in which they were only allowed down one route, twice to food and twice to the owner, so they could learn that what they saw at the end was what they would get (two dogs needed extra trials). Then they had 20 trials in which they had a free choice. Most dogs sometimes chose food and sometimes chose the owner, but over the 20 trials they made different choices. Using a complicated statistical technique called Hidden Markov Models, the scientists were able to show a correlation between caudate activation for food vs praise in experiment 1 and the dog’s overall choices in this experiment. In other words, there is a link between the activation shown in the scanner and the choices the dogs made in the maze. It’s difficult to generalize these results to dog training since the dogs in the scanner did not have to do anything in order to receive either the food or social interaction. It was a test of whether they liked something when they did not have to do anything to get it. (And of course they could not move, because if they moved the imaging would not work). In studies of dog training that compared food to petting and praise, food was a better reward. 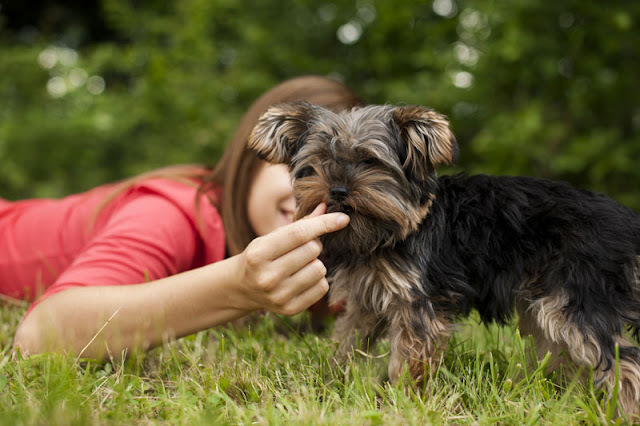 Another study in which dogs made a choice showed that dogs prefer petting to praise. Although much of the media coverage of this study has said dogs prefer praise over food, there are a few things to take note of. One is simply that the praise condition was actually sight of the owner plus praise in the fMRI experiments, and presence of owner plus petting and praise in the behavioural experiment. Essentially, it’s a ‘social interaction with the owner’ condition, not just praise. It would have been interesting to have an extra condition in which food was presented with the owner in sight. Would that have been the best of both worlds?! Given the headlines that dogs would prefer to be trained with praise, it’s worth noting that food was used to train the dogs to participate in fMRI studies. (For details of the training, including video, see Berns et al 2012). By definition, the dogs in this study are highly trained, since they have been trained to keep still during the fMRI scan. The results may not generalize to untrained dogs or to situations outside the laboratory. For example, these dogs will have heard a lot of praise associated with the giving of food, and so may have formed strong positive associations between them. In real life situations there may be other competing motivators, such as squirrels to chase and new people to jump on. As most of us have discovered, in these circumstances we need something potent to provide an alternative motivator for our dogs. The sample is small, although this is not uncommon for studies in what is still a new field. Most of the dogs in this and other fMRI studies are Retrievers, Labs or Border Collies. While this helps with interpreting the images (as differences in head shape pose problems for interpreting images), it also means the results may not generalize to other breeds. One day, they say, it may even be possible to use MRI in the selection of working dogs. These results show that owners do mean something to their dogs. While this probably doesn’t surprise anyone who lives with a dog, it’s nice to have evidence for it. They also show dogs like both food and their owners. It’s up to you to find out what motivates your dog. And just because food works best in dog training, it doesn’t mean your dog doesn’t love you. The paper is open access and the link is below. It’s worth looking at the supplemental materials which include videos of a dog in the behavioural choice task. Thanks for such a clear explanation of a complex study (and topic). A good reminder to us all to read beyond the headlines.